Messages from Christmas 2010 through February 2012. 124 pages, 8 1/2 x 11 spiral bound format. 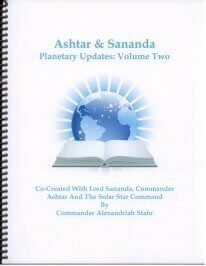 Ashtar and Sananda Planetary Updates: Volume Two is a continuation of Volume One published in 2011, messages from Commander Ashtar and Lord Sananda on the status of the Planetary Ascension channeled through Commander Alexandriah Stahr from her blog which is no longer online. These are updated messages in the moment with what Commander Ashtar and the Ashtar Command - Solar Star Command is doing to transition the Planet through the 2012 Portal to the 13.13.13 Solar New Earth Reality Timeline. These timely messages explain what is going on and the issues that you may be aware of and are dealing with as we journey through the dismantling of the MATRIX and the re-establishing of the Christ Vibration Reality on the Earth. 124 pages, 8 1/2 x 11 spiral bound format. Ashtar and Sananda Planetary Updates: Volume Two is a continuation of Volume One published in 2011, messages from Commander Ashtar and Lord Sananda on the status of the Planetary Ascension channeled through Commander Alexandriah Stahr. These are updated messages in the moment with what Commander Ashtar and the Ashtar Command - Solar Star Command is doing to transition the Planet through the 2012 Portal to the 13.13.13 Solar New Earth Reality Timeline. These timely messages explain what is going on and the issues that you may be aware of and are dealing with as we journey through the dismantling of the MATRIX and the re-establishing of the Christ Light Reality on the Earth.